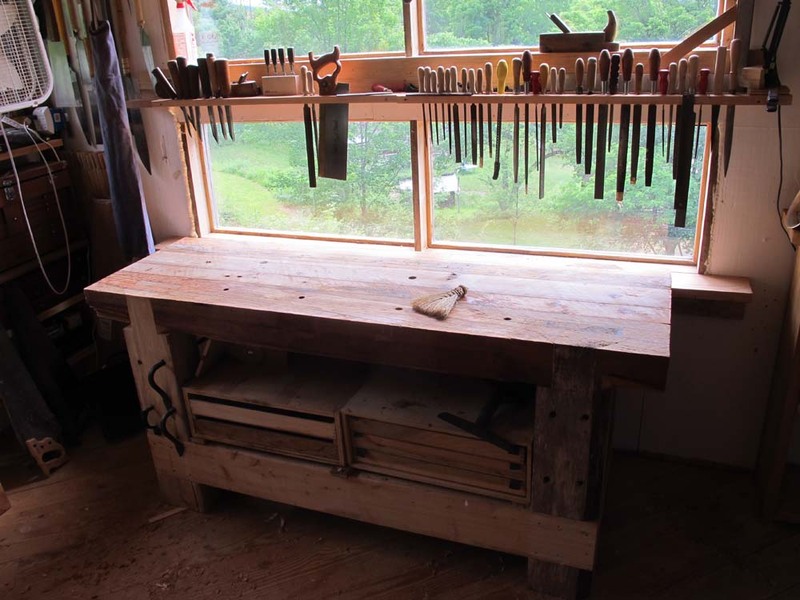 This was my first Roubo bench, built from leftover timbers that were part of the original barn in Illinois. It’s been several years since I built it, and I never really did get the top finished all proper. Now it is. Using my scrub plane on opposite diagonals I got it pretty darned flat. At that point I slathered it with some of the Schwarz bench varnish of 1/3 polyurinate, 1/3 tung oil, and 1/3 turpentine. 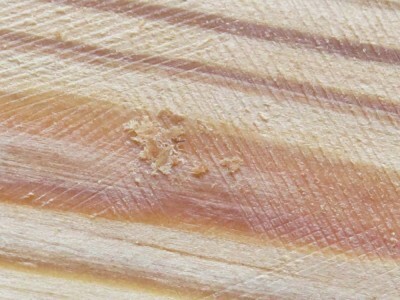 I did it at this point because two of the timbers turned out to be eastern white pine and were a bit soft compared to the southern yellow pine; I hoped the softer timbers would be firmed up by impregnating them with the varnish. They did, but only after a week or so, which was way longer than I was willing to wait. 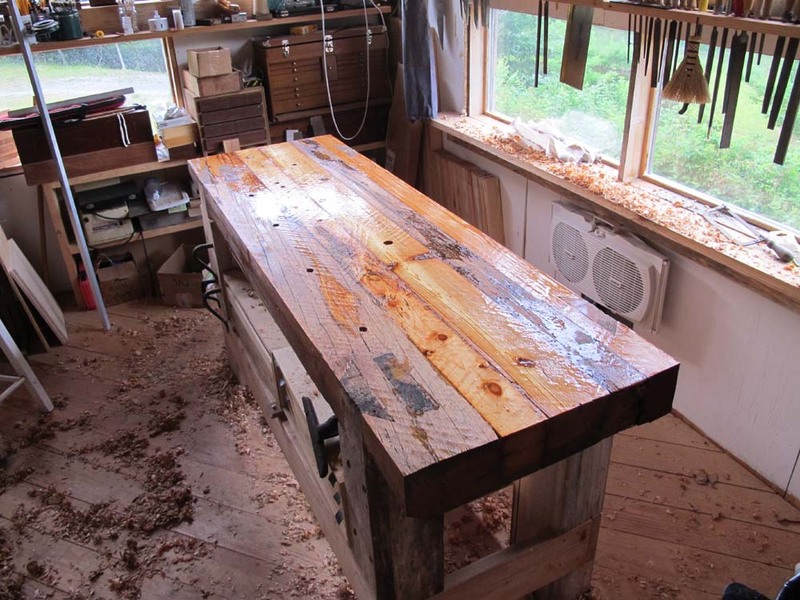 I followed the scrub plane on the varnished top with a toothing plane, on opposing diagonals again, checking to make sure everything remained flat. I prefer the tightly checkered surface of the toothed top as it grabs the work piece a little better than a smooth surface. In the years since fabrication the entire unit has twisted a tiny bit, so I have a thin shim underneath one of the legs to keep it from rocking. 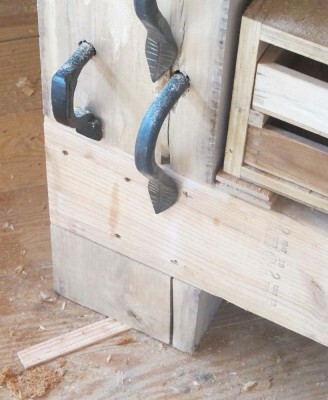 I have not installed a leg vise, even though I have a vintage one ready to use. I’m just trying to see how long I can keep on using the bench as is, with my workpiece-holding functions solely with holdfasts. Above the bench I finally built racks to hold a multitude of tools, mostly files, and am hanging saws and the like off the joists with nails. 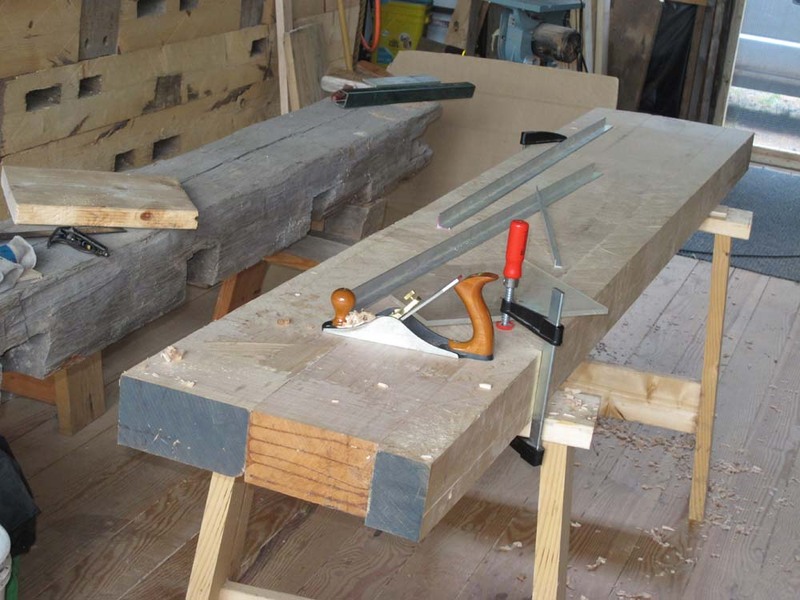 No doubt this may soon be supplanted by the group of in-process benches in line awaiting my ministrations, including a 5″ solid maple top with white oak legs bench; my French Oak Roubo Project bench, which is slowly being uncovered by the ongoing archaeology within the barn; a pair of Roubo benches also made from salvaged barn timbers (although I am almost certain to hang an Emmert K1 off one of them); a mahogany slab and black walnut legs Roubo bench (I was originally going to use this for a Studley bench, but have now decided to build a Studley bench the way Studley built it instead), and finally the true Studley bench. I’m thinking I may need to install some of my existing or future benches up on the fourth floor. That’ll take a passel of stout guys even with a compound block-and-tackle.